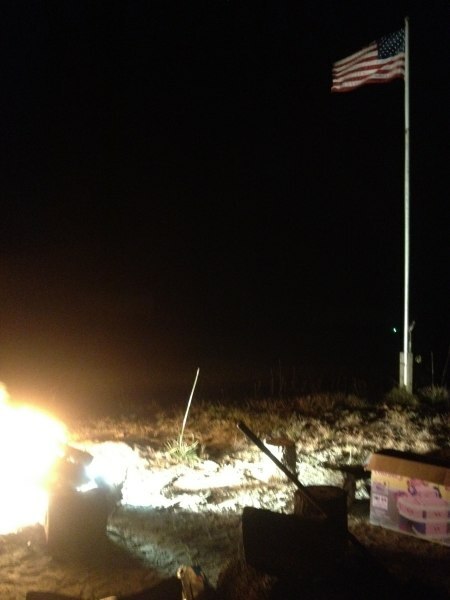 This blog is a great start to 2012. Thanks. I have a suggestion for a discussion…post a brief summary of the differences in displacement choices for those of us still early in the engine build or still deciding? And a question…planning a West Coast Corvair College this year? Good to hear from you. First, we are thinking of holding an event in California this year. We are looking at May 5th weekend in Chino at Steve Glover’s hangar where he runs NVaero. Steve is having a KR gathering there and an open house at his shop that weekend. I have known Steve for many years, and his two commercial hangars at Chino are well equipped to have a very productive College. Steve and I think that having the two events on the same weekend would be a good exchange of people and ideas. The Corvair is a very popular engine choice in the KR, and Steve wanted all Corvair builders to understand that they are more than welcome at his place. 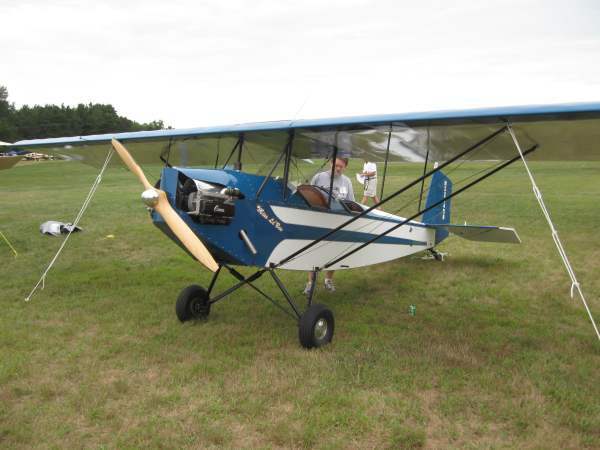 (Besides owning a series of KRs, Steve also has a Long EZ and a TriPacer; he is an all around aviation guy.) The only thing that has kept me from putting it on the schedule is a 50/50 chance that the weekend will conflict with my brother-in-law’s retirement from 30 years in the Army. In our family, such an event is “AHOD” (all hands on deck). We will know more in two weeks, and post the information here, under the “Events” heading. 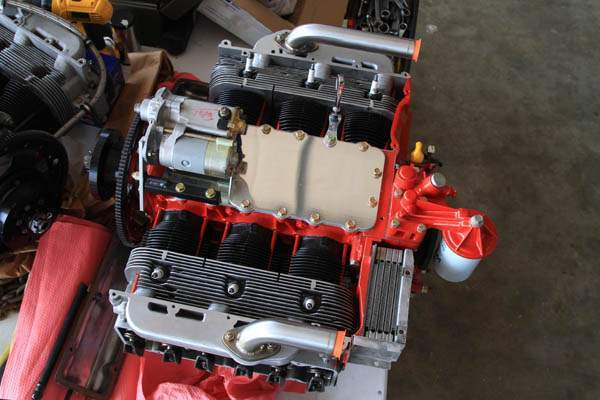 2,700cc, 100hp, based on stock Corvair cylinders which are rebored from .020″ to .060″. Requires no machining to case or heads. Uses either Sealed Power or Clark’s Forged pistons. This is the engine that 85% of builders are working on. More than enough power for a Pietenpol or a KR, a good choice for a 601 or 650. There are many flying examples of each of these airframes with this engine displacement that have individually logged hundreds of hours each. 2,850cc, 110hp, based on Clark’s heavy duty brand new full fin cylinders bored .105″. Requires no machining to the case or heads, it is a straight bolt-together engine. This engine uses U.S. made forged pistons that are available through us. We sell a Piston/Ring/Cylinder/Rod Kit for $1,750. The pistons have a 7.7cc dish in the head to lower the static compression while maintaining a very tight quench area, giving the combination of good combustion and outstanding detonation resistance, even on unleaded fuel. The engine is also the best choice for later turbo-charging. The displacement is a good choice for any Corvair powered airframe. Photos of CC #19 show Jeff Cochran’s running 2,850 built for his 750, and you can look at CC #21’s coverage for pictures of Clarence Dunkerley’s running 2,850 that he built for his Cleanex. Our Web site coverage of Oshkosh 2011 has a lot of photos of Woody Harris’ 601 that he flew on a circumnavigation of the U.S. Woody’s plane is powered by a 2,850. 3,000cc (3 liter) engine, 120hp. This is based on custom machined cylinder castings that are related to VW castings. The bore size is 92mm, but we use the HD casting that is the same as a 94mm VW cylinder. The piston in this engine is the big brother of the 2,850. It is forged in the same U.S. factory, and features a 10cc dish. This provides the same combustion characteristics in a slightly larger displacement. This engine does require having the cases bored slightly for the larger cylinder spigots and having the head gasket area opened up slightly. This job must be done accurately, and the price is included in the Piston/Ring/Cylinder/Rod Kit. This displacement is a good choice for any Corvair powered aircraft. It has flown on both the 601 and 750. Given these three engines, we no longer steer builders toward previous engines like the 3,100. There is nothing wrong with 3,100s, but they did prove difficult to build for many people without a lot of previous experience. The internal dimensions were a compromise because the 3,100 used a modified VW piston with a different compression height, requiring the engine to be built with custom length pushrods, etc. The 3,000cc engine was our clean sheet of paper, based on what we knew after 10 years of building 3,100s. A 3,000cc engine is a better engine from a number of angles, and is a better engine choice for builders considering using unleaded fuel in the future. Every flying Corvair needs four pieces of cooling sheet metal that came from the factory. These pieces are the two under-cylinder baffles, and the two end plates on the firewall end of the engine that go between cylinder #1 and the distributor and on the other side between cylinder #2 and the oil cooler. These four pieces of sheet metal are just as vital to the engine’s cooling as a radiator hose is to a liquid cooled engine. Because a lot of engines have very filthy or rusty metal, we have decided to make sets available to builders. 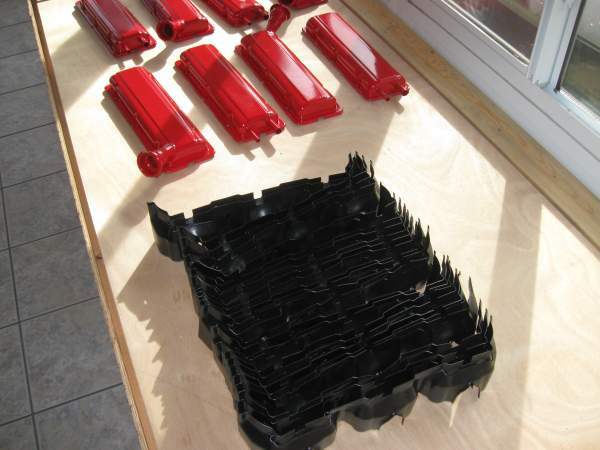 They are very time consuming to clean, even if you have a blasting cabinet. I took a large collection of these pieces to our powder coating guy, and let him professionally blast them, and then powder coat them matte black. They are not required to be powdercoated on your flight engine, but getting a set from us does save some time, and they look very nice, a good compliment to a sharp looking engine. We are selling these sets for $99 plus your old parts by check or money order payable to William Wynne, 5000-18 US HWY 17 #247, Orange Park, FL 32003. If your core came without, please send us $120. Please email us at WilliamTCA@aol.com to let us know they’re on the way. We’ll reserve a set for you. As an introductory offer, we are going to cover the shipping of our parts to anywhere in the U.S. We will do this through the first 10 sets in the shop. Above, the two end baffles in the bag, the two under-cylinder baffles are below them. All of the parts are powdercoated matte black. Above, 14 sets of under-cylinder baffles ready to be sent as part of the four piece cooling sheet metal sets. In the background, freshly done powdercoated Valve Cover Sets. 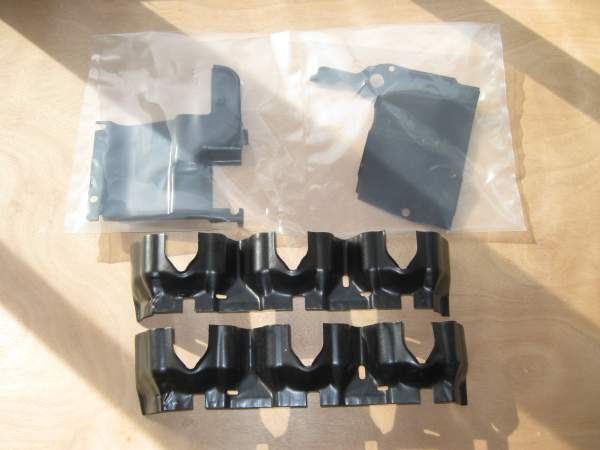 Valve Cover Sets are available for shipping in the U.S. for $159 by sending a check payable to William Wynne with your old valve covers to 5000-18 US HWY 17 #247, Orange Park, FL 32003. Please email WilliamTCA@aol.com with your choice of Red, Blue or Black as well as your horsepower or FlyCorvair.com designation. Our friend and welder, Vern Stevenson, has had a lifelong love affair with all things mechanical. 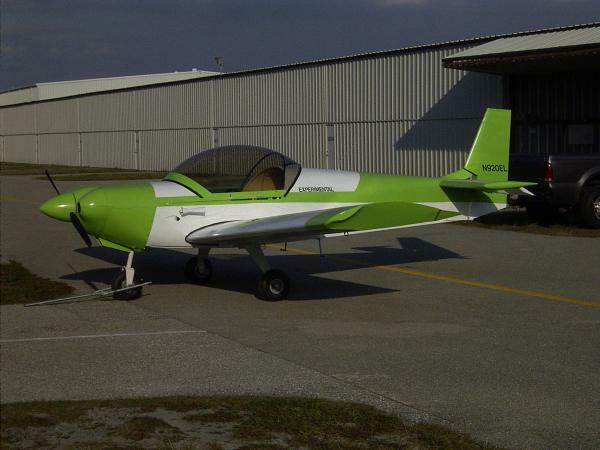 He has built a number of different aircraft, mostly light single-seaters. His hangar is just down the way from ours, and a tour of it is an education of how much a man with imagination, skill and some material can do. In addition to his aircraft, the hangar houses a motor home made from a former Greyhound bus, a 1968 Shelby GT-500, Various Big Block trucks, a 300 HP Corvair sand rail, a Porsche 914 powered by a 327 Chevy, and many others, all handmade by Vern. Vern’s current passion is aerodynamic cars. Growing up in humble circumstances, Vern fully espouses the pure hot rodding of the 1950s, an era that placed creativity and mechanical ingenuity above all else. I have been to rat rod car shows with him, and he points out that his friends have always been doing it “old school.” None of them are interested in a car or a plane that is just another purchased product. It has to be handmade to have any interest to them. Although they could buy any car part they like, or most finished cars, they don’t. To Vern and his friends, one of the rewards is demonstrating incredible skill at bargain hunting, horse trading and bartering. Among his friends, Vern is the unrivaled champion of these talents, and the two projects have a parts total price that reflect this. Above is Vern’s “Streamliner.” It was inspired by Craig Breedlove’s land speed record attempt car, “The Spirit of America.” Vern’s car is aimed at looking the part, but taking a shot at 70 MPG. 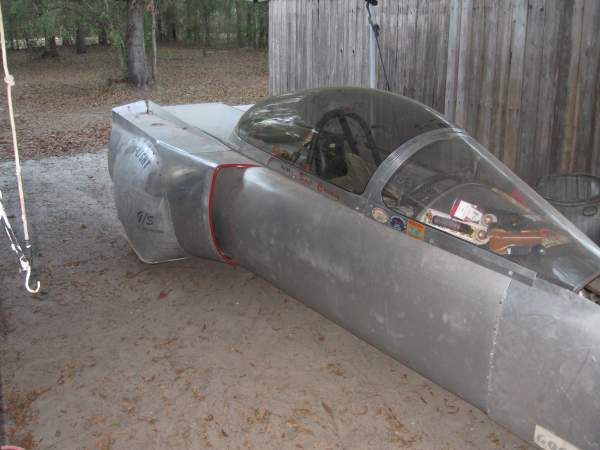 The car has 3 wheels, and is considered a motorcycle in Florida. 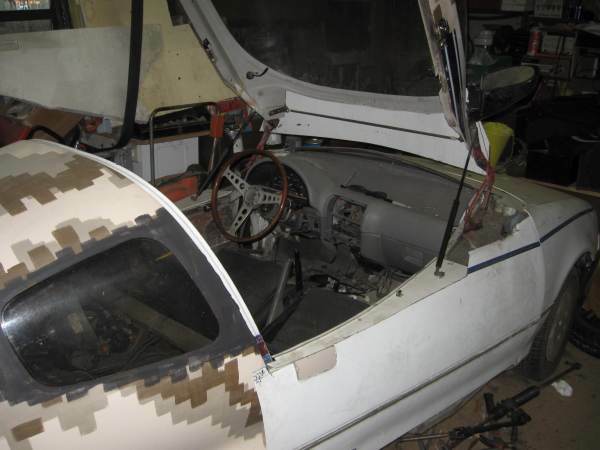 The aluminum bodywork is all salvage material. It hides a mild steel frame that looks like an aircraft fuselage. The canopy came from the Sun ‘n Fun flymart for $30. The engine is derived from a very early Dodge Omni, and I think it is a VW based design, something like a Rabbit engine. Vern has handmade a very tall set of rear wheels to cut the rpm at speed. The weight is around 900 pounds. The car is a two-seater. Vern keeps good track of his spending as a matter of pride. He has several hundred hours of work in the car, but he has less than $500 in total materials. Above is Vern’s yet unnamed project. He has been messing with it part time for the past two months or so. It is also a three-wheeler, and makes the grade in Florida as a motorcycle. (Car insurance is not cheap in this state, and motorcycles are exempt from the requirement.) 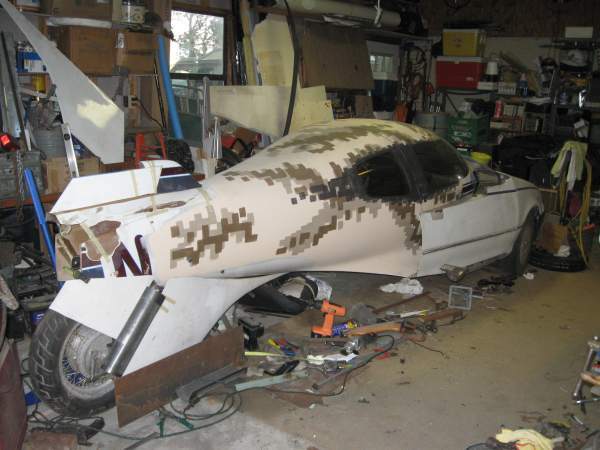 If you look closely, you can see that the back half of this creature is a two-seat Lancair fuselage. The front is a Geo Metro front end. As crazy as it sounds, Vern has artistically blended the two. It isn’t going to win the New York Auto Show, but every motorhead that has seen it has been captivated. The design was driven by the fact that Vern’s girlfriend didn’t like the tandem seating of the Streamliner. The digital camo paint job is an experiment in how you break up the shape differences of the front and back halves.The rear end is out of a Suzuki motorcycle. There is a steel tube subframe that joins the A-pillars of the Geo to the longerons and the spar carry through of the Lancair. Above, a look inside the new project. It retains most of the dash and the pedals of the Geo. The steering column has been moved over about 3 inches. The wheel has a race car style quick removal to making getting in easier. The hinge mechanism for the canopy is the rear gate hinge from a minivan. The seats are 914 leftovers. Vern is hoping for a comfortable cruise and 60 mpg. By trading some time and parts, Vern has kept the budget ultra low. He is just now getting to $150 of cash laid out. 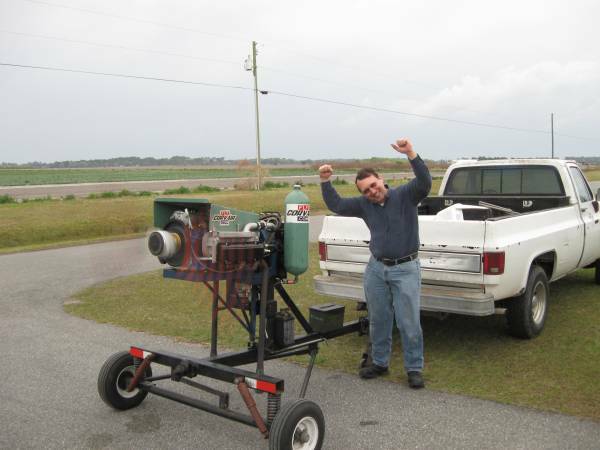 He claims that he is willing to “go all the way” (Spend $500) to see the project through being roadworthy. If either of these vehicles have special driving requirements, it isn’t an issue, Vern has a 40 year history of driving anything with an engine from Stock Cars to excavators. He is a gifted motorcyclist, and he is sensitive enough to machinery that he taught himself to fly ultralights without ever taking a single lesson. In the 1980s ultralights were powered by a number of two strokes not noted for reliability. In his first 500 hours he had 18 engine outs but never got more than a scratch. Neither of these two are directly related to flying Corvairs, but I stuck them in here to point something out. While Vern is speaking of, or working on these vehicles, he is among the happiest people in the World. The simple joy of creating something with your hands using tools is a real joy in life. If you are at home and it has been a while since you have had that kind of rewarding feeling, make a plan to get back to it. Many people get into homebuilt aircraft because they falsely believe it to be an inexpensive way to having a completed aircraft. Building to these people is a necesscary evil. These people actually have a very poor record of completing planes because they derive very little joy from the process. If you have any doubt that a great number of people in homebuilding are driven by just wanting the plane and have no desire to learn or build their craftsmanship, look at how much advertising space is devoted to dubious claims of 300 hour build times and questionable stories about how few skills it takes to build some designs. Although knowing what you’re up against timewise is a valid question, and you should know if a design requires you to be a machinist, specifically trying not to enjoy the building process nor learn anything has sold a lot of kits, but it hasn’t finished many of them. The build it yourself nature of the Corvair, and the fact that learning here is a goal, not an evil, makes the Corvair movement different. We are glad to assist anyone who is entering The Arena to Learn, Build, and Fly in the company of other friends who feel the same way. 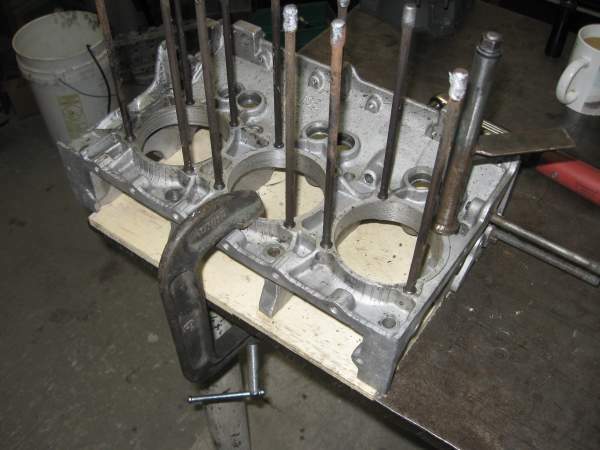 When we assemble an engine, one of the steps that I take is to test the head studs before we put the case together. It is a quality control step, and if one of the studs is slightly weak, I want to know it before assembly because it is a lot easier to fix before you build the engine. The procedure is fairly simple, and the tooling isn’t very elaborate. I bring my set to Colleges and show builders there the process in person. Here, in a few paragraphs and pictures, you can get a good overview. Based on building several hundred engines in the past 20 or so years, the chances of getting a weak stud are low. About every 10th engine will have one. These studs were overstressed on disassembly or were overdone on a previous build. They look good on the outside, but the stud has been taken past its yield point. 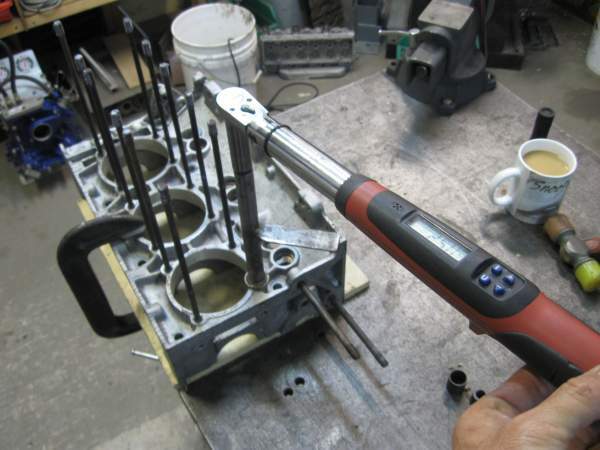 Above, the test set up.The test is made easier with a high quality torque wrench, but it will work just the same with a beam type wrench. The small spacer on the arm allows the same tool to measure the longer top studs. The little tube is just a collar for the spacer, not required. The ends of the tubes need to be fairly true to the tube, the best method is turning them in a lathe, but careful work on a belt sander will do the same task. Backing up a moment, I am going to assume that you have pulled and replaced all the studs that had hard tool marks from previous owners’ vice grips, and also pulled all the studs that have harsh rust pits. Mild surface corrosion is not an issue, and a missing thread at the top of the stud on the fine thread end isn’t a reason for rejection either. Many years ago, I taught engineering labs at Embry Riddle in the Materials Department. People who have been through these classes know what a Tinius Olsen pull test machine is. For the rest of the gang, it is an immensely strong set of jaws pulled apart by a very powerful hydraulic system. Many of these systems can pull 50 thousand pounds without bogging down. A test sample of material is put between the jaws and very slowly pulled apart, while computers measure the length and power of the pull. This all happens at a very slow rate, pulling 1/2″ can be slowed down to take several minutes. Instead of demonstrating the machine on expensive test samples, I brought in bundles of Corvair head studs. We pulled them apart in every class. It gave both myself and the students a much better understanding of the effects of corrosion and mechanical damage like tool marks. A used Corvair stud in fair condition may not look that strong, but it takes over 10,000 pounds of pull to get one to neck down and break. Because of this testing I have a pretty good idea of what is too much damage on the outside of a stud. But the testing in these photos tells the condition of the stud on the inside of it. Above, the washer and nut are in my hand, the tube is viewed end on showing the wall thickness. The tube has a little stand welded on it from a 2004 test series where we measured how much the studs stretched when they are torqued. At full torque, the studs are almost .035″ longer. This is an outstanding design feature. The engine is “spring loaded,” and the studs maintain their clamping force through a very wide range of engine temperatures, and expansion and contraction cycles. Engines like the Jabaru have very short bolts that hold the heads on. Bolts like that typically need continuous checking, because even a slight amount of material compression under the head of the bolt will result in a loss of torque on a short fastener. Conversely, a long stud is comparatively immune to this. Certified aircraft engines have the heads permanently screwed to their cylinders for a number of other design reasons, but engines like the Corvair, VW and Porsche all use the long studs. These are part of a well calibrated system, and are the primary reason why you should not use an aluminum cylinder on a Corvair. Porsche 911s eventually had aluminum cylinders, but they also had uber expensive “Delavar” studs, with an expansion and contraction rate that was compatible with their alloy cylinders. Companies that have offered aluminum cylinders for Corvairs have not taken expansion into consideration. Making the studs thicker or stronger actually only exacerbates the issue. Corvairs are designed for steel or iron cylinders, and they have an outstanding record of reliability with them. Coat the threads on the stud and the washer with silver anti-seize. Drop the tube over the stud, run the washer down and then the nut. Carefully torque the nut to 15 foot pounds. Noting the clock position of the wrench handle when you start, raise the torque to 20 pounds. Typically this will require turning the wrench about 45 degrees on the short studs, about 55 degrees on the long ones. Next, raise the torque to 25 pounds slowly. Now, the critical observation: It should take the same 45 or 55 degrees of rotation on the nut to get the new torque increment. There is an acceptable range, and you shouldn’t be too concerned about a variation of 15 degrees or so. But, if you have a stud that requires 100 degrees of rotation to go from 20 to 25 pounds when all of the others took only 45 degrees, you have found a weak stud, and it needs to be replaced. Above, the tool on a lower stud, giving a better view of the auxiliary arm on the tube from a previous test. The arm plays no role in this stud check up. Note the plywood under the case. Don’t let the mating surfaces sit on a steel table, concrete or any other rough or hard surface. 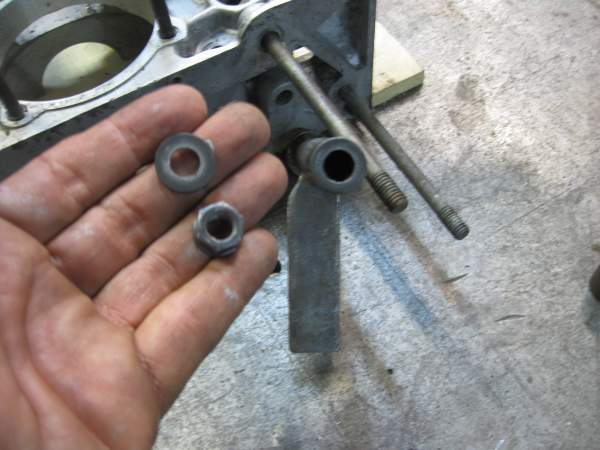 A weak stud undetected is not going to lead to an engine failure. Typically, when a builder has a bad stud, he is torquing up his heads and notices that one stud turns way too far. This is the point where it would have been better to test before assembly. But even if it goes undetected at this point, the typical stud will not break, it just will not be clamping as tight as the others holding down the cylinder. In time this can lead to a blown head gasket. Above, the task in action. 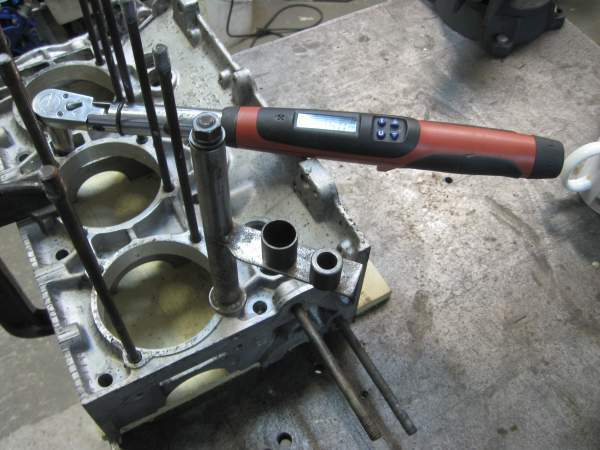 The torque wrench is a $300 Snap On item, pricey, but an outstanding piece of quality. Ours is called Excalibur. If you ever meet an A&P mechanic and he has a pair of sunglasses or shoes that cost more than his torque wrench, be guarded about taking his advice. Paul Gauguin’s paintbox was more valuable than anything else he owned. The brush doesn’t make the artist, and the tool doesn’t make the mechanic, but it is a measure of whether a man considers his work a craft or just a job. A Corvair is a very tough engine, and I have seen several of them fly a long way on a blown head gasket. The engine makes power on the cylinder even if the gasket is blown because at RPM the compression doesn’t have time to bleed through a tiny gap. A blown head gasket on a liquid cooled engine is a different story because it can mean a loss of coolant either out of the engine, into the crankcase, or into the combustion chamber. Liquid cooling is better in theory, but air cooling is better in practice. (A liquid cooled engine is less likely to ever blow a gasket, but if the discussion is about aircraft, you are mostly concerned about how the powerplant behaves after the event, not just the likelihood of the event.) In Corvairs, I have seen about 10 engines with blown head gaskets in the past 15 years. Almost all of these were caused by the timing not being set with a light at the static rpm. Only one or two were caused by a weak stud. Both of these causes are easy to avoid. Testing your studs before assembly avoids a small chance of a hassle on final assembly. On final assembly, be alert for studs that take a lot more rotation to reach the rated torque value. When studs are torqued with anti-seize, we have done very careful tests to prove that you are getting the same clamping value at 28 foot pounds as a builder with light oil is getting if he torques the stud to 35 pounds. Use anti-seize, and stop when you get to 27-28 pounds. If you go all the way to 35 you are exerting a lot more force than required, and may actually be doing damage. Remember, you got into experimental aviation for the learning and adventure. 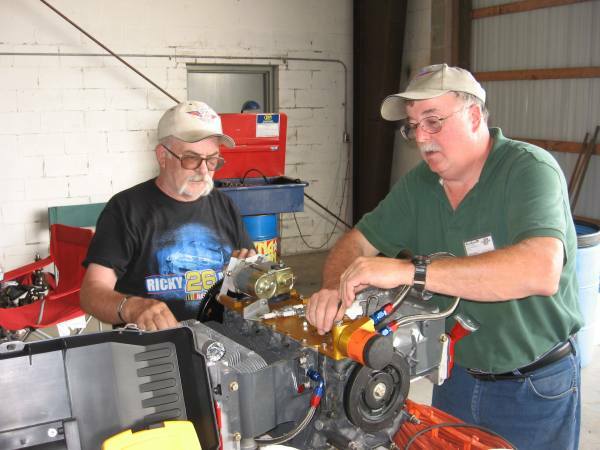 Take pride that successful Corvair engine builders know a lot more about how engines are really built than any other group in experimental aviation. Big news on Scottie Blankenship’s Corvair-powered Highlander: on January 10th, at the Just Aircraft factory (where Scottie works), he ran his Roy-bearing engine for the first time — on the airplane. It fired right up, and the wonderful sound and smoothness of the Corvair dazzled a lot of people. Scottie still has a little work to finish up the airframe, but the first Corvair-powered Highlander will be in the air soon. My 3-liter engine is at Roy’s now, and I expect the engine and I will be at his next hosting of the Corvair College. Though my Highlander is still well behind Scottie’s, I’m building every day, so I’m making steady progress. The blog is a fine idea. Thanks for your continued good work. Thanks for the photo and the update. Hopefully we’ll see this bird at Sun ‘N Fun 2012? Please give our congratulations to Scott. Looks like and outstanding job. Send us the word and a photo when the first flight happens. DO YOU KNOW YET, WHERE YOU WILL BE RECOMMENDING THESE NEW HIGH VOLUME OIL PUMPS BE USED? This pump is only recommended to builders using a Weseman bearing. Roy tends to use stock pumps with his bearing. Send us an updated flight report on your airplane and some fresh photos when you have a chance. I’m no guru, but oil is a subject mechanics really toss about. I’ve heard a million reasons for or against a certain oil, oil pressure, volume, SAE grade, etc. I sold Amzoil for about 2 years and my hardest sell was to aircraft mechanics. I knew it was tough as nails oil, and it could really take the punishment of aircraft engines. I ran it in everything, cars, boats, motorcycles, and I could not convince the aircraft owner to put it into aircraft applications. I think that opinions are like noses, everyone has one. Aero Shell was what they wanted, and they were not to be swayed. Shell is a very good lube, but I think Amzoil is a tougher product. Perhaps the fact that they are more armchair quarterbacks, than actual pilots who assess the real life issues facing piloting a homebuilt. 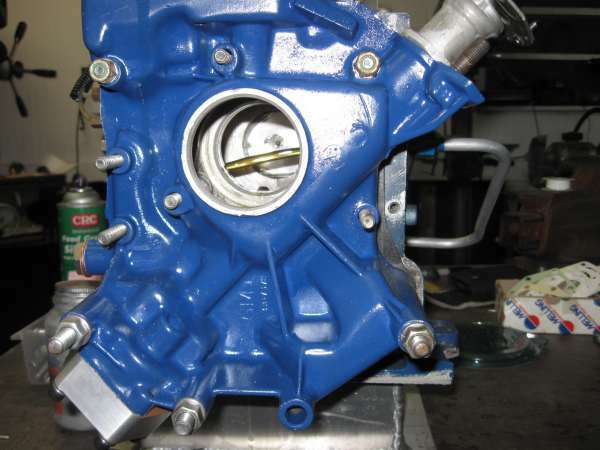 Besides, this heavy duty oil pump was accepted and ok’d by Scoob E. That’s enough for me. William be well. Thanks for your comments. As you’re an airline mechanic, I hold your opinion in high regard. We flew a lot of hours on Amsoil and it works great in a Corvair. I want to caution builders to NEVER use Aeroshell in a Corvair. It has no zinc phosphate in it, a required element that is protecting the cam and lifters in a Corvair. Our favorite oil remains Shell Rotella T 15W40. I enjoy reading your writings, philosophy and about your experience. I feel and work very much on the same principal as you, and relate to your philosophy because I feel we are driven by the same things, and also our need to learn how and why. You are doing an excellent job of getting the word out on your work, and I while I am still in the early stages of learning about and building my Corvair conversion, the more I learn, the more I know I have made the right decision for me and my project. Thanks for your kind words. I write the stuff from the heart. It doesn’t resonate with everybody, but the style is honest and a number of people, like yourself, appreciate it as an addition to the technical expertise. Keep us posted on your progress. Is this the same high volume pump I saw at the last College in November? 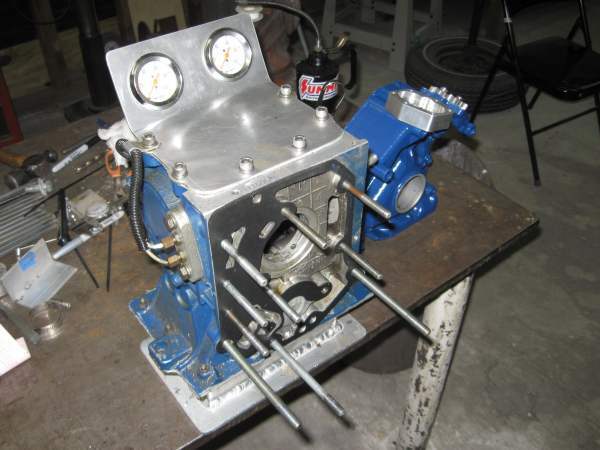 I wasn’t that familiar will all of the parts but I thought I saw a machined deep case like the one in the picture at your table along with the carbs. It was a nicely machined piece. Yes, we had the prototypes at CC #21. The Colleges are often the first places we display new ideas. This is a great site. Thank you for taking the time to put it all together. I read through this article on the balancer with interest. I really appreciate the pictures and your detailed explanation. This gives me a much better picture of what is going on, on that end of the engine. My balancer is stock that came with the engine. I had thought of using it but I am now having second thoughts and will probably replace it with a rebuilt. Is there a good way of telling if the balancer is good? On your balancer, if the rubber is extruded above the surface of the metal, I would not trust it. Rebuilt balancers have a eurethane type material in place of the rubber. Dale Balancers have a four-digit serial number stamped on them and two witness marks to align the inner and outter part. If you have one of these, it is good to fly. The billet crank, for the reasons stated, looks like a very promising approach. The methodical and careful approach to R&D is what impresses. At the same time I can appreciate that the standard 164 Corvair is more than adequate for an airplane such as the Pietenpol that I’ve started on. The best evidence we have available suggests you’re right. If someone wanted to use a billet crank in a Pietenpol, I’m all for it. If someone chooses to fly another aircraft on a stock crank, I’m all for that as well. As I stated in the post, I’m here to present the data as we know it and let each builder decide for himself what makes sense on his own aircraft. Thanks for your responses regarding my motor mount. I am still practicing my gas welding technique. It has to be good if I’m going to attempt to tack-weld to a spool on a wood table top! On another note, I was wondering if you could comment/report on the status of the turbo set-up. Even though I am 90% set on the 3L option for the heavier Rebel (about 925 lbs. empty), turbo normalizing on a bush plane seems like a good match (max take-off power even at high density altitude, etc….). Roy hasn’t even started on my 3L conversion yet, so it’s not too late to change my mind. Here’s the good news: A 3 Liter engine has the dished pistons in it which allow later turbocharging should you choose to upgrade to that. We had very good results testing the compatiibility of turbos and OT-10 cams. There are a few small changes to turbocharging an engine, but they are all external on a 3L. Anyone building a 2,850 or a 3L engine is in a good position to upgrade to a turbo later if they choose to do so. It will not require changing anything internal on the engine. Back in the day when I worked in a shop remanufacturing Allison transmissions we used TimeSerts. Never saw one fail. Did however see some Helicoils unravel during disassembly for whatever reason. Perhaps not adequately installed? But none I saw failed in operation, only disassembly. Thank you for the comments. The number one thing that helicoils and some time-serts have a problem with is having excessive carbon hanging out on the end of a sparkplug thread protruding past the helicoil into the cylinder. When such a plug is removed, the carbon will occasionally jam the threads and back out the helicoil. For this reason, I like time-serts in sparkplug holes on Corvairs more than helicoils. However, helicoils do a darn good job in places where the bolt will not be removed and replaced frequently. I like the Panther construction concept. Is there any new info on Ed Fisher’s Fleet or Zipper designs? Ed Fisher is not currently actively working on either of those designs. Your new blog is the perfect forum for this kind of information sharing. It is so easy to get distracted by the noise and chatter of the online discussions that seem to attract strong (but often uninformed) opinions from self-proclaimed experts. I continue to appreciate your practical approach to helping builders follow a proven path to their first flight and beyond. Thanks, William. Now it’s back to the shop so I can see you in the air in 2012! I thought you’d appreciate the photo above taken during the housecall I made to you after Corvair College #18. Keep us posted as you close in on your first flight. Part of my job for a multinational corporation is to train Chinese engineers to maintain and operate coating equipment. It takes a while to get them to understand the importance of maintaining tight tolerances. I think I’ll go for an original GM crank nitrided. The original GM crank nitrided with a fifth bearing is the most popular combination that people are building for their Zenith aircraft. Although there are a large number of 601/650s flying without a fifth bearing, many of these people plan to upgrade to a Weseman bearing. We recommend that everyone with a STOL airplane utilize a 5th bearing because they can generate large asymmetric loads at high angles of attack. I concur with your evaluation of Chinese manufacturing. They are capable of making some excellent products, but quality control is not their strongest suit. Price is their strongest motivation, and, when they compete for business with other businesses in China, their margins are often paper thin. China has a vastly higher number of engineers than we have here in the U.S., but in their move from what was basically a feudal, agrarian, society before the revolution, to a much more modern and still economically controlled society, there have been a number of shortcuts that have been taken. It shows up in quality. It’s the wild west there. There are no standards and they don’t use W. Edwards Demings’ quality control principles in many of their products. Caveat emptor. I read your comments with special interest, aware that your mother and father worked a great deal of their lives in mainland China before the revolution. Your international background, hailing from an American family working in China born in India, gives you a unique take. Years ago I worked for a computer manufacturer that had our circuit boards built by relatives of the CEO in China. These boards were plagued with compatibility issues, and I headed up the service organization charged with making them operational. This is where I learned a lot about the Chinese philosophy of manufacturing. Two things still stick out. The Chinese are VERY frugal, to the point of using a known incompatible component until it’s gone from inventory. The silk screened revision number might be correct, but the mix of parts on the board was anybody’s guess. And they also have a common saying when dealing with westerners. It goes “You can ALWAYS fool the foreigner!” We think this is unethical. They think it’s good business practice. I keep these two things in mind whenever I purchase anything. I’ll pay double or triple if I can avoid the serious quality issues inherent in Chinese hardware. But, I still like Chinese food. Thanks for your comments. 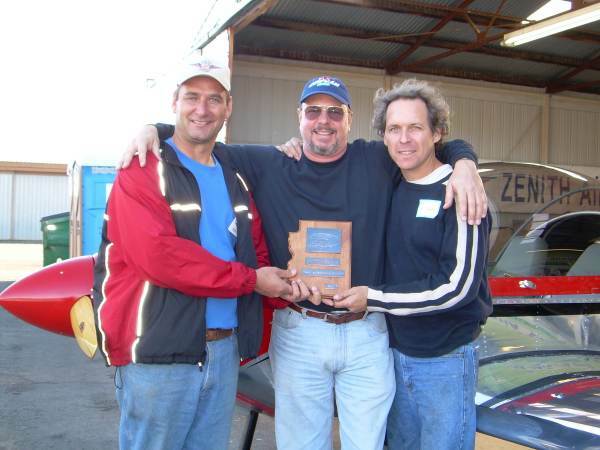 We included the above photo with you in the center flanked by myself on the right and Michael Heintz after you won the Best Engine Installation Award at Copperstate in 2007. We also love Chinese food. Our local restaurant is owned by a family that emigrated from Kowloon. When you think about it, the food they make now is made in America. Well said William, my trust is in your vast experience with the Corvair. We’re here to present the facts. We trust your ability to decide for yourself based on the data we present. Thanks for taking the time to provide a well thought response to the crank issue. Hopefully those who need to know this story will read and understand its full meaning. Your thoughts on this carry some weight. The fact that you work for the engineering branch of General Motors and understand international manufacturing makes your recommendation noteworthy. Looking forward to seeing your airplane airborne this year. Talked to Ken P tonight and learned about this blog. Looking forward to lots of good info being passed around. We couldn’t have gotten this started without Ken’s help. He’s been an unbelievably productive and encouraging friend for many years. Nice blog site! .. I’m very glad to see you back on the web with a Q&A forum that includes pics. It’ll be a great resource to builders and Corvair flyers alike. I just passed 80 hours last weekend on my Corvair-powered Zenith CH650 and the engine I built seems to produce even more power in the past 30 or so hours .. I assume that’s because it was finally breaking in? I have yet to re-pitch my Warp drive prop just yet as I’ve been enjoying flying too much on any nice weekends. At 3000 rpm I get 115 mph indicated on these chilly days here in Indiana .. and that’s at 8.5 degrees of pitch. By the way, I firmly believe the Corvair engine is a perfect match for my home-built aircraft and delivers outstanding performance for an engine that I built and can maintain going forward. Thanks again for launching this site and the support you will provide here. Great to hear from you. Thank you for the progress report. If you can e-mail us a few current photos, we’d like to do an aircraft update on your plane here like we did with Andy Elliott’s. A YouTube video link also would be greatly appreciated. I just found out about the blog; guess I have been living in the past. The content is great and I look forward to learning from the discussions. Love the philosophy! Looking forward to seeing your engine fire up and run for the first time at Corvair College #22. Thanks for the positive word on our new efforts. These valve covers look really nice. I wish mine were powdercoated, but I didn’t even think of that, back in the day. I think this blog is a great idea. It looks like this will be a great forum to record your vast knowledge about all things Corvair. I watched the YouTube video the other day of your airplane flying over Daytona Beach. It had 30,000 hits on it. You’re a movie star. Send us a few new photos and an update and we’ll write a Flying Planes post about you like Andy Elliott’s. It’s great to be connected with you in this way, looking forward to staying in touch and up to date! Just like Phil, we need updated photos of your aircraft, preferably some in-flight, and word of your adventures to date. Just email it them to WilliamTCA@aol.com. Looking forward to reading it. Glad to see you get this site up and going. I always liked reading the daily Q and A on the other site. Flying the Piet every chance I get a warm enough day. Great to hear from you. You’re one heck of a tough guy flying an open cockpit plane even on warm winter days. Hoping to see you at Brodhead again this year. It’s great to have a single-point resource for open discussions on the Corvair conversion. Have been following “The Movement” for several years and am now building a CH650 which is slated for Corvair power when the time comes. However, I must say that my enthusiasm was curbed a bit after hearing of Mark’s crank failure but I remain optimistic that this conversion will continue to evolve into a reliable alternative power solution. Thanks for all of the expertise and insight that you so generously share with the rest of us. Looking forward to following along with hopes of sharing something meaningful in the future. Thank you for the note. We’re going to cover a lot more of the successful flying Zenith aircraft, to give people a more rounded view of how many successful flying aircraft there are out there on Corvair power, particularly Zeniths. The notes above include 3 guys who are out there flying the Zenith/Corvair combination you’re building. Given all the data, most builders agree it’s an excellent combination. Hope to see you at CC #22. I really like the new Corvair Communication Center, you all did an oustanding job setting it all up. Great to hear from you. We had a fanatastic time with you at Corvair College #21. Looking forward to seeing more of you this year. Keep up the good work on your project and please email us photos of your project. Good to see you back, missed you over at Corvair list. Buttercup is sleeping nice and snug, hope to have shop room in a month. Looking forward to a CC at Roy’s place. Good to hear from you. I was just saying to Roy that the housecall we made to your place may very well have been the northernmost one I’ve ever made in the U.S. Good to hear that your plans for a shop are coming together. There are many people who would like to see you put the rest of our old Buttercup project together and demonstrate how well that combination will work. Please keep us posted on your progress with photos. I would post some pictures of my Dragonfly/Corvair but I am not sure how to do that on this blog. I am not a blogger does one have to join a group or something? Since you’re a real life rocket scientist, we would have figured you knew all about blogs. You do not have to join or subscribe, you can just come here and read and send us photos to our regular email address, WilliamTCA@aol.com. This blog has a notification feature that will let you know when we have something new on here if you click on the RSS link and subscribe. Looking forward to hearing of your first flight. Just saw Pat P’s note about this site on Mark’s list. Glad to see you back online. Thanks for the encouraging word. Tune in, we’ll have a lot more to say here. Good news is that you are doing this blog site. I feel like my principle information source is again available to me. My 2850 cc is mounted and waiting on me to finish up the remaining tasks of completing the the Sonex, such as wiring the panel and painting. Just a couple of more months! Great to hear from you. Watching you and your brother work together at CC #21 to get your engine up and running was fun and inspirational. I got a message from Sensenich the other day, so I suspect your 54×56 prop is ready to go. Looking forward to seeing your bird in the air this year. Congratulations William this is a wonderful blog site. It will be a real asset to Corvair builders and flyers. Great to hear from you. I used the flywheel tool you graciously gave to us just the other day. Brought back nice memories of having you at CC #17. The new blog is great. I hope to be in your flying section soon!!! Great looking Blog William. Great to hear from you!!! 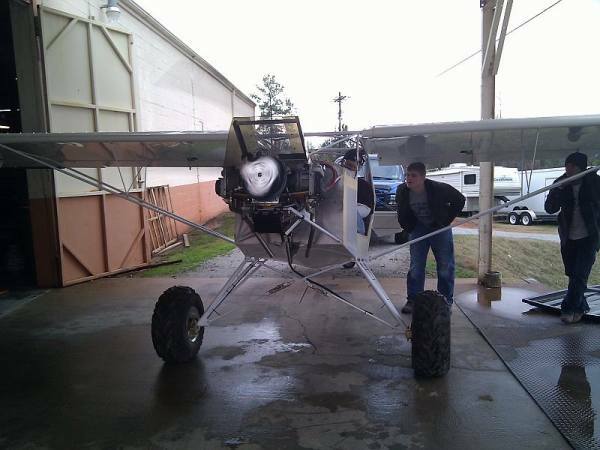 We thought you’d like your airplane being featured in the Stainless Steel Exhaust article. Keep us posted as you close in on flying. 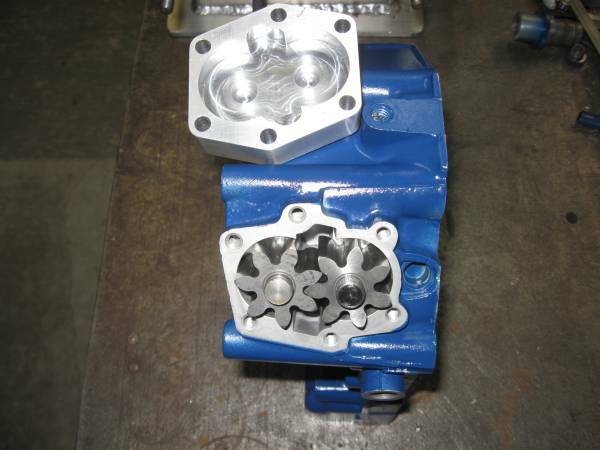 The following photo series is of testing a new High Volume Oil Pump that we had made. The assembly and testing covered about 5 hours on Friday night. When I was in my 20s, I used to make a point of donating 10% of my week’s pay to Anheuser-Busch corporation on Friday night. In the past 2 decades, I have found more productive things to do with weekends. Years ago, people saw how much time I spent at our old hangar and often said that I practically lived at the airport. After Grace and I were married, rather than trying to get me to come home from work earlier, she came up with the solution of moving the house closer to the hangar. For the past 6 years they have been 10 feet apart. Our hangar is 40’x50’, but I do most of the work in the adjoining 15’x30’ shop seen in the photos. Our hangar is a basic metal pole barn without insulation. The workshop is fully insulated and got an older central heat and A/C system installed last year. (We have a neighbor in the HVAC business who needed a Warp Drive prop.) Although we live on a little airport, working in the small shop next to the house gives me the same feeling I had when I first got started building planes in the garage behind my house at 1235 International Speedway Blvd., Daytona. Working in the shop makes me think about all the other builders out there working in their garages, basements and workshops, all the people enjoying the hours creating their plane with their own hands. No matter how diverse homebuilders are, they all have this in common. Here is a shot of the basic unit. A high volume pump is basically a longer set of gears with some type of extended housing. The extended gears are from a small block Chevy V-8, and they are identical to a Corvair’s except they are .400” longer. The next time some brilliant guy in your EAA chapter tries to tell you that Porsche or Franklin designed the Corvair engine, you can ask him why he thinks the oil pump is interchangeable with a V-8. The Corvair is 100% Chevrolet engineering. 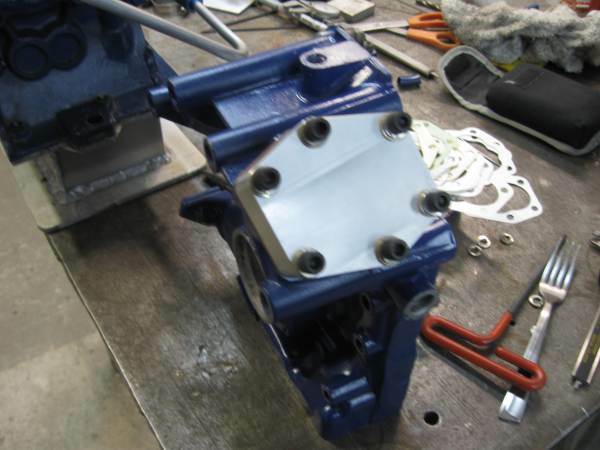 The extended housing on high volume pumps is usually a two piece affair that his held together with roll pins, it can be a little tricky to set up, and it does have some pumping losses from a less than perfect fit in the assembly alignment. It also has two gaskets in it. Above you can see that our housing is a one-piece bowl-shaped unit, CNC machined. Instead of aligning itself on roll pins, it centers itself on the two shafts, which are stabilized by the housing. This is not a new concept, this style had been made before by Corvair car racing guys. However, our unit was sized from scratch, and independently developed to serve aircraft guys. It is self aligning, has minimal pumping losses, and only has one gasket. If you have been around Corvairs only a few years , this is a tool you may not have seen before. I built it many years ago to test oil systems. It is the back half of a Corvair case with a little sump added underneath. It has plugs welded in a lot of places to seal it, and the gauges are set to read oil pressure before and after the bypass. 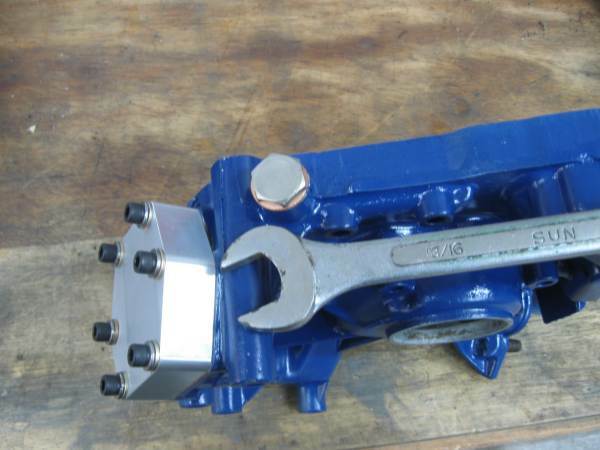 It has a valve to allow mimicking any bearing clearance and oil flow requirement. This part is actually a rare “RL” case from a 180hp turbo Corvair, but it is special for another reason: It flew several hundred hours in our Pietenpol. Over the years, we have tested many cases on this unit. 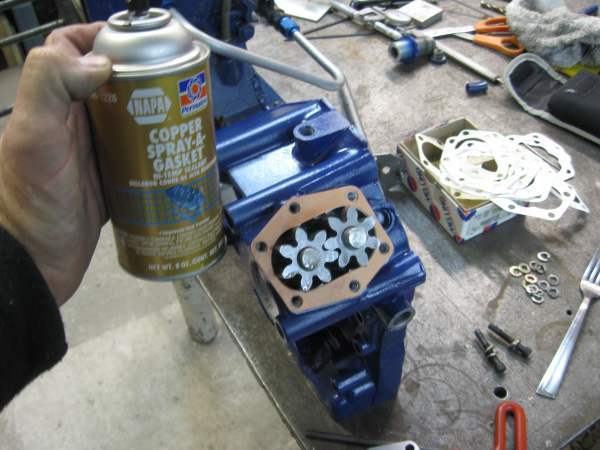 After we moved to Gold Oil Filter Housings, we stopped working on rear oil cases for builders because most Gold Oil Systems use our replacement oil cooler bypass valve built into the Sandwich Adaptor. This unit was very good at detecting a marginal stock oil cooler bypass, in addition to testing oil pumps. Over the years, I have made lots of pieces of custom testing equipment, because testing is the most important element that we do. Many people have an idea about making a part. If they have time and money, or they are amateur CAD guys, they can get a machine shop to make the part. Some of these will function, and a still smaller fraction will work with other required parts in a way that fits in the final installation. Some of these parts will actually pass basic testing. But the real testing requirement is not showing it will work, but aggressively trying to find the way the part, or under which circumstances, or in which combination it will not work. Few people understand that this is the real focus of testing. Most people who conceive of an idea, defend the concept, nurse it through manufacture, and then start testing it have a big emotional attachment to it. At that point, they believe in it. They have a very hard time trying to develop any test that will show the part or concept to be deficient or vulnerable. For testing to be of any real value, you have to run it as if it is being directed by your worst enemy, your ex-wife and her mother, and the guy at work who thinks homebuilt aircraft are crazy. For the period of testing, you have to pretend that these people have PhDs from MIT and Cal-Tech, and they want to find any flaw in your idea. You have to really let go of any emotional attachment to the concept’s success. This is really what running an effective test is all about. Adhering to this over the years, we have tested a lot of ideas that never saw the light of day. All of the things we do make were refined by the process I just outlined. Our evolution in the development of the engine and installations was never hampered by an emotional attachment to the way we were doing it. Once a month or so, I will get a guy on the phone who will say something like “well you used to do it that way” referring to the set-up he is planning on using in his plane. He saw in an old photo on our Web page, and is yet to understand why it evolved. His attachment is understandable, it’s how we did it once, and he doesn’t see the forces that drove the evolution. I talk a lot, but I am also a very keen listener, and in the conversation I can hear if they guy has an emotional attachment to the old way, and if he is resistant to the logical reasons why it evolved. You don’t have to build your Corvair the way we do, but when evaluating your choices, be very cognizant of the emotional attachment factor creeping in and not letting you truly evaluate the merits. Homebuilders by their very nature arrive in the field wanting to do something different. They are reluctant to be seen as conformists. This is a good concept, but it can also work against the practical goal of completing the plane. If 10 new guys all look at the logic of why we build engines the way we do, evaluate it, and then choose to build their engines that way, this is not a sign of conformity, this is critical thinking leading many people to the same point. There will always be some guy on the Net who criticizes this and tells everyone how his engine is going to be totally different, that is once he gets started building it. 20+ years of working with homebuilders has taught me that the odds of that person flying anything are microscopic. But it isn’t primarily because his idea is bad, actually the Achilles heel of his whole concept is that It is emotionally driven by a force that has very little sustenance in it, the concern for what other people think of you. In the background, a selection of oil pump gaskets in different thicknesses. This is how Corvairs set the pump clearance. After test fitting them, and checking for a slight drag on the pump while turning it, I settle on a .007” thick gasket and give it a light coat of spray copper before sealing it up. Here is the unit all buttoned up, Yes, I ate dinner at the workbench. This plug holds in the spring and the pressure regulation piston. 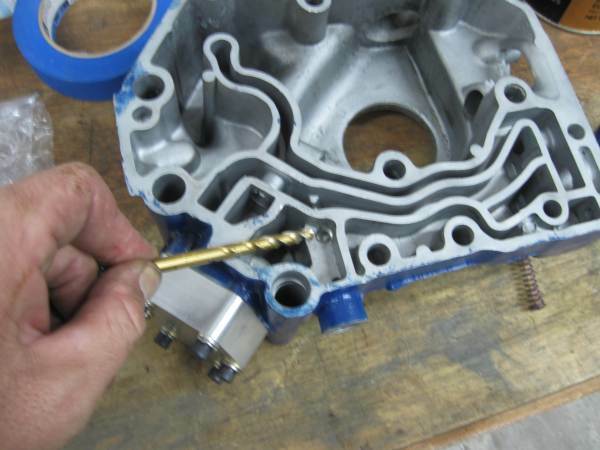 Make sure your piston is polished and the bore has no burrs left over from enlarging the hole. I use a copper crush washer for the gasket. I use the higher pressure spring from Clark’s. The wrench size is 13/16” but it has small fine threads, so don’t do more than 15 foot pounds or so. I do not safety these, and I have never seen one get loose. This plug is shiny because I nickel plate them. Above is the unit in action. It is being driven by an electric drill on a priming shaft, just the way we prime the engines at the Colleges before we run them. After running through the system, the oil is returned to the center of the case by the 3/8” aluminum hard line on the right; it is entering the case where the #1 cylinder was. Notice that you can actually see the oil stream flowing in the photo. From there it goes back in the bottom of the case and is sucked into the pickup again. The new pump flowed like a river, even at very low rpm. We are going to let it run for a long time in the shop this weekend, with the drill trigger held down with a zip tie. It will be noisy, but I have my sister’s old 1970s stereo that she bought with babysitting money in the shop, a hold over from when people cared about sound. 120 watts, Ohlm speakers and an extended cut version of Exile on Main Street and I will never notice the sound of the oil pump rig running all weekend. Monday we will take it apart and look for any wear on the inside. Grace and Scoob E were out in the shop helping with the project. Above, Grace ran the drill during the set up tests. This rear cover will have a Gold Oil Housing on it when it is finalized, but for testing, I have it set up with one of our old style oil top plates from the 2004-2007 era. You can see the built-in pressure gauges in this photo.